On January 9, I was invited to talk to the annual housing outlook seminar convened by HFO Oregon. A video of my remarks is available on YouTube. My presentation addressed a number of themes that will be familiar to City Observatory readers. Housing markets around the country are increasingly being shaped by the growing demand for urban living. Cities that offer great urban amenities are facing rising demand, while suburbs, exurbs and weaker market urban cores are struggling. This demand for cities is underpinned in major part by a generational shift in preference for city living over more distant suburban locations, and has manifested itself in a rising relative price for real estate in and near the urban core. In turn, the growing preference for urban locations of the young and well-educated has attracted employment growth to urban centers. Because the critical resource for fast growing technology and professional service firms is a ready supply of well-educated workers, location decisions of these firms are increasingly dictated by the H.R. department. As we’ve documented at City Observatory, this has led to substantial and widespread increases in employment in city centers, effectively reversing a decades-old trend of employment decentralization. Underneath the growing demand for urban living are many of the attributes well-understood by urbanists. For example, our research, and that of others shows that consumers are paying substantial and increasing premium to live in walkable locations. In addition, places that enable residents to drive less also enable households to save money. We estimate that the lower rate of daily driving in Portland compared to the typical large US city produces annual savings of more than $1 billion for local consumers, a Green Dividend that helps fuel the local economy. The mismatch between the growing demand of urban living and a relatively slowly changing supply of urban housing has been the principal sources of housing affordability problems in the past few years. That cycle has plainly played out in the Portland market. 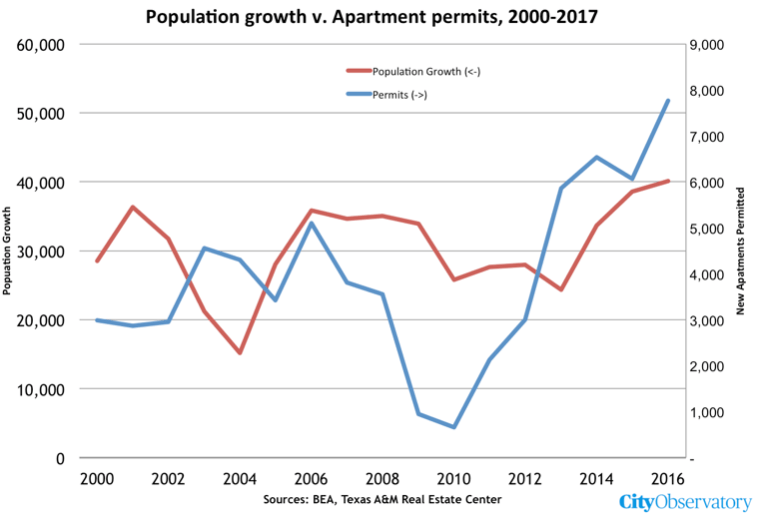 While the region had been adding between 4,000 and 5,000 apartments per year in the first decade of the 2000s (the blue line on the chart below), new construction fell off a cliff during the Great Recession. But due to the continued attractiveness of the Portland region, more people kept moving in (the red line). In the face of rising demand, the supply drought produced a predictable increase in rents. But if the past three years have demonstrated anything it is that supply and demand really work in the housing market. New apartment completions have rebounded, and the region completed close to 10,000 apartments in 2017. The additional supply has, in turn, caused the rate of rent increases, which was in the double-digits just a few years ago, to fall below zero. 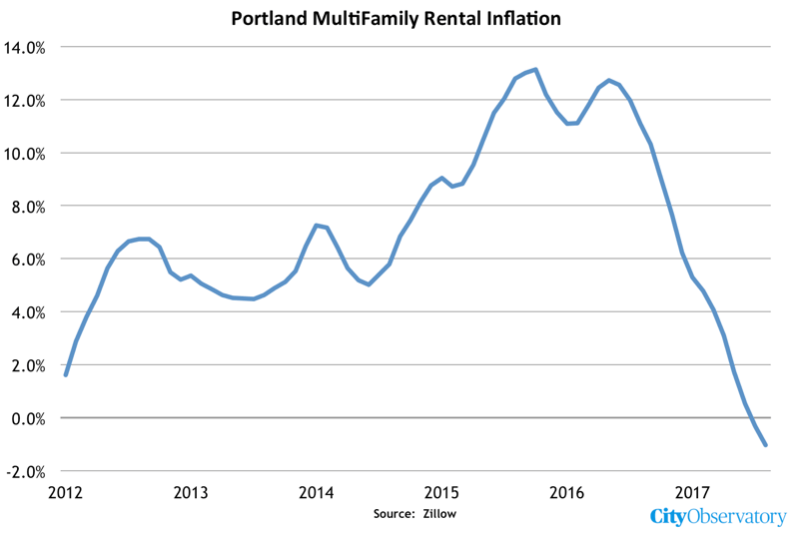 Portland’s experience is powerful evidence that increasing housing supply has a significant effect on rental inflation. In 2019, and in the years that follow, our central challenge will be figuring out how to build more housing in the kind of amenity- and opportunity-rich, diverse, bikeable, walkable and transit-served neighborhoods that Americans are increasingly demanding. If we do it right, there’s a tremendous opportunity not only to tackle our problems of housing affordability, but to build neighborhoods that are more diverse and inclusive.